An hour and half before Bradly Richards opens the doors to his shop he sits on a wooden bench in the parlor’s waiting room, stuffing petite plastic jars – the kind you find in a retro 25-cent candy dispenser – with pomade from Anchors Aweigh and Shear Revival. Richards jokes he’s a terrible salesman, but this gesture is his way of introducing guests to two products he strongly believes in. They both happen to be one-person companies much like The Humble Barber Company. “I hope they [customers] are able to walk away feeling better about the way they look and equipped with the information on how to recreate that look, if they choose,” said Richards. The last stinger, “if they choose” is an extension of Richard’s personality, a sense of genuine care towards the client’s experience without any pushy salesmanship. That’s when you begin to notice there’s something different about The Humble Barber Company. Perhaps it is the picket fence patrons have to open before entering into the waiting room, the eclectic playlist ranging from The B-52s to Johnny Cash to feminist punk groups like Le Tigre, the reserve of Black Label beer in the fridge or maybe it’s the shocking notion a half dozen grown men are waiting hours for a new haircut. Bradly Richards, owner of The Humble Barber Company on the intersection of Brighton Road and Davis Avenue. Richards, who previously owned and operated The Vault Coffee and Tea Bar on California Avenue, left the specialty coffee world after 17 years to take an apprenticeship under Ray Mustovic. After graduating from the Barber School of Pittsburgh, Richards worked under Mustovic for five months. Mustovic, who passed away a year and a half ago, and his shop served as a source of inspiration for Richards’ own business. “I want a humble little place that my dad or grandfather would’ve gone to where everyone is welcomed; [a place] where you would go, come in, hang out and be comfortable. And that’s what I really tried for is to make this an encompassing, welcoming place,” said Richards. 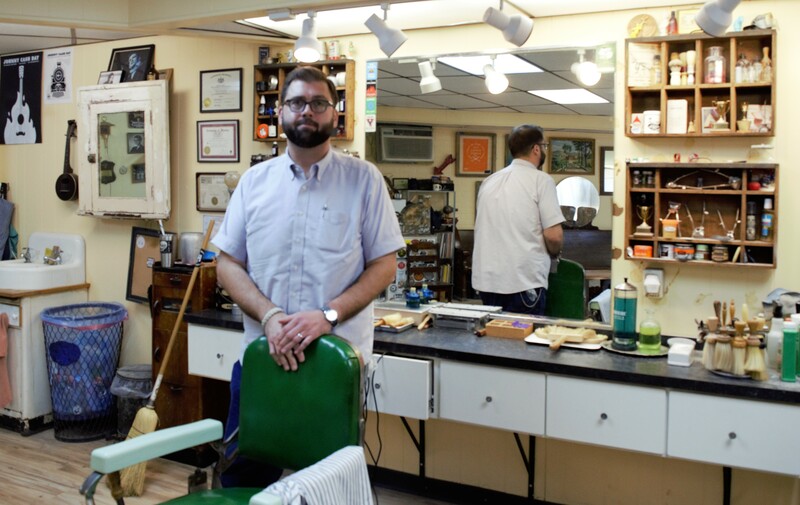 The Humble Barber Company is a walk-in only location where Richards takes approximately 16 to 19 customers per day. The goal was to always have an inviting one-chair shop with a level of intimacy, where the attention is focused not on the waiting room, but rather the guest in the chair. Currently The Humble Barber Company is nominated for a “Best Barber” Award in part of the Pittsburgh City Paper’s “Best of” series. A nomination Richards is flattered by, yet he still doesn’t take himself too seriously. Modest words from a humble barber. The Humble Barber Company is open Monday to Wednesday 12 p.m. to 8 p.m. and Thursday to Friday 10 a.m. to 4 p.m. For more information visit their website.